Ride a coach from Christchurch to Queenstown during a fully narrated sightseeing tour via Mount Cook village, situated at the base of New Zealand's tallest mountain. Other South Island highlights include the fertile farmlands of Otago’s Canterbury Plains, glacier-fed Lake Tekapo and the grandeur of the Southern Alps in Aoraki/Mount Cook National Park, a UNESCO World Heritage site. Opt for an included 3-course buffet lunch at the Hermitage Hotel. If you’d like, take a helicopter or ski-plane flight (own expense). Nach der Abholung von ausgewählten Hotels in Christchurch geht es morgens nach Queenstown. 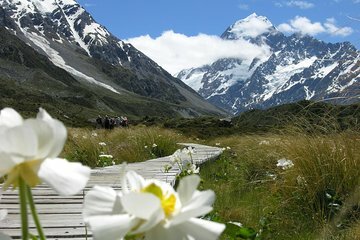 Die 11-stündige Fahrt über den Mount Cook umfasst Sightseeing-Stopps und eine Mittagspause. Während Ihrer Reise durch die Landschaft von Otago und die Südalpen hören Sie an Bord Live-Kommentare, während Sie die lebendige Naturpracht der neuseeländischen Südinsel beobachten. Wenn Sie den zum UNESCO-Weltkulturerbe gehörenden Nationalpark Aoraki / Mount Cook erreichen, besuchen Sie das charmante Mount Cook Village an der Basis oder den Mount Cook (Aoraki). Bewundern Sie den höchsten Berg Neuseelands, der 3.724 Meter über dem Meeresspiegel thront. Genießen Sie hier ein Mittagsbuffet, falls Sie dies wünschen. Teilen Sie Ihrem Fahrer mit, ob Sie einen optionalen Rundflug mit einem Hubschrauber oder einem Skiflugzeug mit Schneelandung aufnehmen möchten (wetterabhängig; direkt bezahlt). Fahren Sie dann durch das flache Ackerland der Canterbury Plains in Richtung der von Gletschern gespeisten Gewässer des Tekapo-Sees, von wo aus Sie die abgelegene Kirche des Guten Hirten am Ufer sehen können. Genießen Sie den Nachmittagstee (auf eigene Kosten) in der malerischen Stadt Omarama am südlichen Ende des Mackenzie Basin, bevor Ihre Tour in Queenstown endet. Eigentlich and quot;nur and quot; eine Busfahrt mit Lunchbreak, alles sehr professionell. Gelegentlich sollten sich Busfahrer ( and quot;Coaches and quot;) aber mal erinnern dass nicht jeder Tourist englisch als Muttersprache hat. Wenn ein Busfahrer über 3 Stunden ohne Pause in schnellstem Kiwi-English durchplappert, wird es auch mal leicht nervig (ich denke mein English ist recht gut, aber dennoch...!). Also weniger ist manchmal mehr. This tour was ok. Lots of sitting and many breaks. Mt. Cook was disappointing. This is a convenient way to see Spectacular Mt. Cook and traverse from Christchurch to Queenstown. Great trip! So much more than a transfer. Saw some great sights along the way with interesting and informative commentary from Tom our driver. Regular comfort stops good and clean for coffee/snacks/toilets. Very comfortable seats. Efficient and punctual to the minute! Highly recommended! The driver was a very good tour guide. He enriched us with lot of history along the way. He stopped at lot of scenic spots and gave sufficient time for photo shoot. However, his assistant for Japanese speaking tourists was rude. If you dont leave some of your belongings on the seat when you leave the bus for lunch then the assistant would take away your seat and give it to other Japanese tourists who join along the way. Our daughter lost her window seat for no reason this way. That ruined our mood during latter half of the trip. But the assistant had no regrets and did not apologize. It appears that Great Sights is more interested in Japanese customers. great way to handle the transfer from Christchurch to Queenstown while seeing a few sights on the way. So happy that I signed up for this trip. The only thing I wish is that we could have had more time in the Mount Cook region. We drove right past the Church of the Good Shepherd without slowing down for a photo and only had an hour at Mount Cook. I didn't have the ability to stay the night in the area since it was booked for the holidays, so this was my best option so that I didn't completely miss the mountain. If you have the option, stay in the area. Too expensive for the value. we hardly stop 10 minutes for photo stop and 45 minutes for lunchbreak.